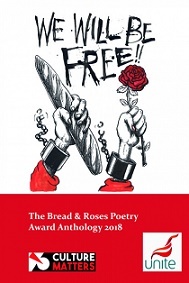 This is an anthology of poems chosen from entries to a competition for poems on "themes relevant to working class life, politics, communities and culture". It was judged by Andy Croft of the publisher Smokestack and Mary Sayer of the Unite union. Themed anthologies are odd beasts. Their big advantage is that they can appeal to readers who might not normally think poetry had much to say to them, or know where to begin with it – indeed they are, unless totally inept, pretty much sure to appeal to readers who share the anthology's particular interest. This reaching out to an unaccustomed audience is a worthwhile thing to attempt, though whether it succeeds would depend, I suppose, as much on the publisher's promotion skills as on the product. The themed anthology has drawbacks too, and most of them depend on the kind of theme chosen. If the theme is narrow in scope, the poems can be too repetitive and unvarying. This is not a problem here, for the theme is a pretty wide one. If the theme is in any way political, religious or ecological, the tone can soon start to sound preachy, and this is a problem in some poems here. The one problem I think nearly all themed anthologies have is that, because the criteria for inclusion embrace theme as well as intrinsic merit, the content tends to be of more uneven quality than would be the case in an anthology chosen on poetic skill alone. Again this depends on how wide the potential pool was: there has been enough good poetry written on the theme of, say, the Great War to fill several anthologies. Here, the pool was the 800 competition entries. Going by the late Leslie Norris's estimate that, in competitions he'd judged, about 10% of the entries were in serious contention, this should have yielded about 80 poems of interest. In fact this pamphlet contains 23, and not all of them would make my cut, but then judging does contain some very personal elements. Trying to get a ticket for our own lives. a raised hand to haul you from hostile waters. Steve Pottinger's poem "Glass collector" is another that derives its strength from its focus on an individual, who defies people's preconceptions about him, and from a play on the word "space". Again this succeeds because it is concerned not only to get its theme across but to use words well and memorably – the best way, by far, to get any theme across, if only polemicists would realise it. Could there be a more pointed or economical way to achieve what Owen Gallagher's Glaswegian narrator does in his coinage of "right hoorable" for "right honourable"? There were several other poems that impressed me in places, though some were, I thought, itching for an editor. A few fell into the category of "carefully observed memories of childhood", a genre I generally find workmanlike rather than exciting, though this may be a personal taste. And a few were just too angry for their own good and ended up sputtering rather than speaking. The introduction mentioned with approval the "passionate" nature of the poems: passion is fine when controlled by intellect and distance, but if passion is allowed to take over a poem, verbal skill tends to take its leave.